A 72-year-old Jewish man was assaulted earlier this week as he was walking on Kingston Avenue. The assailant then went on to threaten both Jewish and non-Jewish passersby that he would “kill them all.” The incident is being investigated as a possible hate crime. 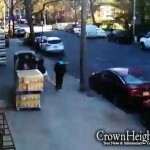 The incident occurred on Kingston Avenue near Lefferts Avenue this past Sunday afternoon. The victim, a 72-year-old Jewish man, was suddenly grabbed from behind by an African-American man and was “bear hugged.” The victim struggled to break free, and once he did, the man then slapped him across the face. Police were called, and the assailant was apprehended nearby and taken into custody. A police source told CrownHeights.info that the man was taken to Kings County Hospital for detox, where he remained for over 24 hours. Once he was released, he was charged with Assault in the Second Degree – a felony – due to the age of the victim. Police further opened an investigation into the incident as possibly having been motivated by bias. Police have identified the suspect as 37-year-old Colin Esposito. Just make sure that he gets jail time,Hate crime or not a dude attacking the eldery is dangerous. The guy says “KILL THEM ALL” & it’s MAYBE a hate crime!! By your thinking one could also say it was a love crime because he hugged him. Guy was intoxicated and may have equally wanted to kill whomever he met, not any particular protected type of person – which makes it certainly a crime, but not a hate crime. is being investigated as a possible hate crime?????? Why is this incident reported so late? No one knew about this? The perp will not get jail time because of Blasiaos new relaxed rules on arrests for quality of life crimes. Just passed Kingston and lefferts, shame on nypd and the Jewish landlord for allowing illegal activities to occur on our street. #6 Are you talking of our great benefactor Landlord? The culprit is filth and must be locked up for life.